Are Russia And Israel On A Collision Course Over Syria? Russian politicians have been surprisingly mute on the Israeli airstrikes in Syria that took place on February 11. Nothing notable has been said beyond an official statement from the Russian Foreign Ministry urging all sides to show restraint and avoid actions that could lead to further complications. The quiet reflects the Kremlin's difficult position. Moscow has been cooperating closely with both Israel and Iran of late, and hence is in no position to unequivocally take sides between the two. As Irina Zvyagelskaya, a member of the Institute of Oriental Studies at the Russian Academy of Sciences, put it, "The situation for Russia is difficult as our country has good relations with Iran and Israel, which share deep differences." Other political commentators say that nothing has changed despite the strikes, because Israel has always vowed to destroy military buildups near its borders. The action was entirely foreseeable, they argue, in view of Israeli Prime Minister Benjamin Netanyahu's comments during his visit to Moscow in late January. At the same time, many Russians are wondering to what extent the Kremlin will allow Israel to continue to carry out preventive strikes on Syrian soil. The incident suggested that an Israeli-Syrian military engagement could evolve into a serious situation that could spin out of Russian control. This is worrisome to the Russians, as they are keen to maintain the balance of power in Syria. On a broader level, the latest incident shows how ineffective Russian efforts have become to maintain a dominant position on the Syrian battlefield. The Turkish operation in Afrin, in the north of the country, made clear that Moscow is unable to forestall the growth of Ankara's influence. Iranian proxy forces are now close to the Israeli border, and Russia failed to accomplish anything significant at the Sochi Conference in late January. Comments in the Russian media hint that, strategically speaking, Russia does not want Israel -- a powerful player -- to enter the already overcrowded Syrian battlefield. This is particularly true since Moscow is working on solidifying its military positions in Syria following important victories. Deep Israeli involvement could unravel Russia's dominant role in Syria. At the same time, suggestions in the Russian media point to an interesting scenario in which the Israeli involvement in Syria forces Russia to more openly declare a pro-Iranian strategy. Up to this point, Moscow has consistently tried -- at least officially -- to cooperate with both countries. Alternatively, some Russian pundits surmise that because Moscow has been concerned that its major ally, Iran, might try to seize the strategic opportunity through its proxies and increase its clout in Syria, the Kremlin might welcome -- if not Israel's total engagement in Syria -- at least some Israeli actions that limit Tehran's power. 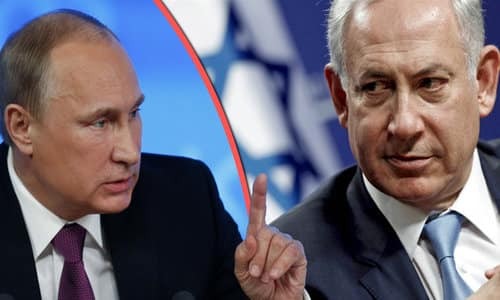 At a January 30 meeting with Russian President Vladimir Putin in Moscow, just days before the latest incident, Netanyahu said, "The most important thing I think is to make sure that we understand each other and that we don't shoot down each other's planes." Indeed, some Russian analysts have raised the idea that Israeli involvement in the Syrian conflict will be confined solely to maintaining security on its borders. Overall, the tone of the Russian media towards Israel's actions has been neutral, while remaining studiously noncommittal about those of Iran. Considering Israel's security imperatives, it is arguable that the Israeli intervention was expected. Tehran is gaining the most from the Syrian chaos. It is likely that Israel will have to respond again, even if the Golan Heights are not directly threatened. Since there are no other official statements from Russian officials, nor direct government leaks in leading Russian dailies such as Kommersant, Izvestia, and others, Moscow's position will be important to watch. Like most players in Syria, the Russians would not welcome additional actors in the country. However, the Kremlin will not be able to forestall further possible Israeli involvement in Syria.